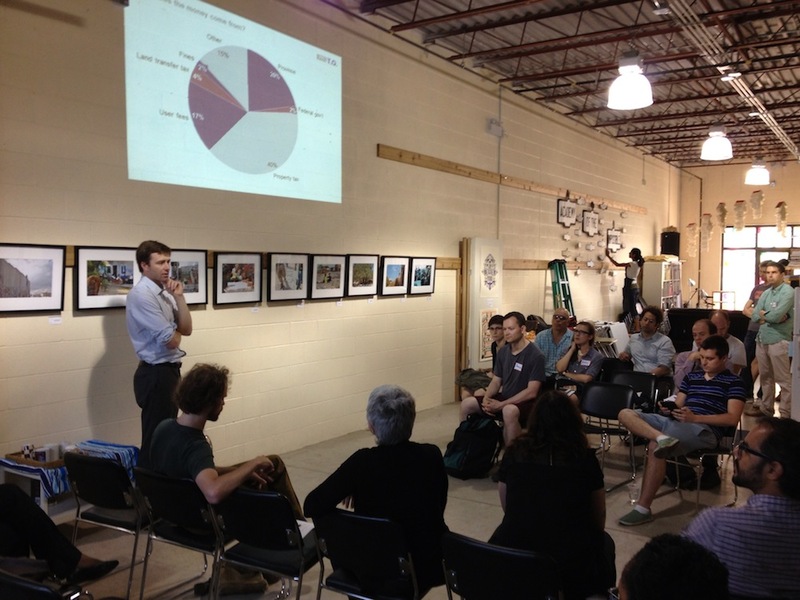 On June 27th, 2013, about 20 people participated in a community workshop on Toronto’s budget. After a short presentation, we broke into three groups, discussing technology, public policy innovation, and citizenship engagement as possible levers to improve the budget process. For a copy of our slide presentation, click here. To see a description of the event posted on the Academy of the Impossible’s site, click here. We did some group brainstorming about improving Toronto’s budget process, covering three areas: leveraging technology, engaging citizens, and public policy innovation. – One priority is to improve the city’s budget website. Materials are currently hard to find, and lack interest/dynamism. – City officials should have incentives aligned to make content more compelling and easily accessible, with a view to increasing website traffic and engagement. – Graphics could be harnessed to promote behavioural change, like how Time-of-Use power usage charts help increase energy efficiency behaviour. – More could be done graphically to establish a clearer link between spending and people’s lives. – Techniques like participatory budgeting could be explored to increase citizen engagement, while being mindful to avoid special interests taking over. – New initiatives should be more proactive and helpful, e.g., offering suggestions that if you like X, you might be interested in Y. – There’s a need to make more data public and in more usable formats; this could benefit from an exercise to prioritize what kinds of data matter most. – As city budgets are often presented as having limited room for discretionary spending, many citizens feel they have limited scope for impact or innovation. – As a solution, the city could make grants more accessible to “change-makers” able to achieve direct community impacts; people could rally around this. – This would mean expanding opportunities to redirect funds to local residents – in effect bypassing bureaucracy and directing funds and decisions straight to community. – Explaining the budget numbers is key. It’s important to find what resonates with people, e.g., drawing comparisons with an individual’s household budget. – Other potential tools include a shadow/alternative budget, online budget simulators, etc. ; consideration should also be given to any limitations of these tools. – One key role is that of budget “translator” – someone who can cut through the numbers and jargon and provide a compelling explanation of relevant initiatives. – The budget process needs to maintain certain traditional aspects of engagement, e.g., maintaining the energy of face-to-face sessions and town halls. – There is a need to initiate a dialogue early in the process so that resident interactions are not entirely reactive. – Focusing on engagement at the ward-level would likely be effective. – There is a need to foster interest in urban affairs/politics beyond the downtown core. – Communications tools should resonate with residents – percentages are easier to interpret, while dollar amounts can turn people off. – Existing public policy tools could be employed, e.g., consider mini referenda giving citizens a direct say in certain budget decisions. – The city could consider creating an independent municipal budget officer (like the Parliamentary Budget Officer). – More could also be done within the existing framework to improve the process and budget products, e.g., clearer graphics and explanations, and a frank presentation of the city’s long-term budget plan and funding challenges. – There might be scope to have cities compete for who produces the “best budget”, e.g., Better Budget Awards given out each year to cities with the clearest presentation, most accessible graphics, best long-term plan, etc. – Could Toronto enshrine a requirement to release a three-year budget plan each year, (perhaps building on Calgary’s current practice of releasing a 3-year business plan and 100-year master city plan)? – Could the city foster more innovation through a more flexible budgeting system? – e.g., empower citizens by allowing for more local innovation – for example letting local citizens help determine the activities allowed in their local parks. – e.g., empower staff by allowing services to be delivered more flexibly, responding to local needs – for example allowing city health staff to deliver services in the community rather than just in standard clinical settings. – A longer-term project could strive to help people understand city budget decisions as a tool for problem solving, for example, articulating a high level problem (e.g., long commute times/vehicle pollution), determining a specific goal (reduce the average commute time by 15 minutes by year x), outline the strategy to accomplish this goal and what it will cost, then report each year on how well we’re doing in meeting our target.